A week before Halloween, I found myself feeling guilty about buying candy and giving it to kids to eat. I reasoned with myself that Halloween comes once per year, but given my personal clean eating lifestyle, would I be hypocritical to continue empowering our high fructose corn syrup, GMO-laden society? So, I decided that this year I would ease into things (because I am not a fan of giving children something I wouldn’t eat myself, but I also didn’t want to get my house egged) – see how it might work if I mixed in a treat with NO high fructose corn syrup, GMO free, gluten free, NO refined sugar, along with the regular candy expectations of trick-or-treaters. Of course, the regular candy I selected (for this one night of the year) were full-sized Baby Ruth’s, 100 Grand bars, and Nestle Crunches. By the way, I tried the full sized bar (instead of fun-sized) a few years ago and found that they were not only a hit (as they were when I was a kid and there was one house in our neighborhood who did this), but they are, in fact, COST EFFECTIVE if you shop like I do. If you have, for example, a Walgreens (or CVS, or Eckerd, or Duane Reade…) store card, there are some pretty cool discounts on these larger bars. So instead of the regular price of $1.00 each, I got them for $0.41 each, and I bought 72 bars. The real cost savings, if you live in a neighborhood like mine in which you cannot predict year over year how many kids will come and you inevitably end up with TONS of left over, small-sized candy, because you bought WAY too much… is that somehow I end up with very few left over bars, happy children, and no waste (because we aren’t going to eat them). 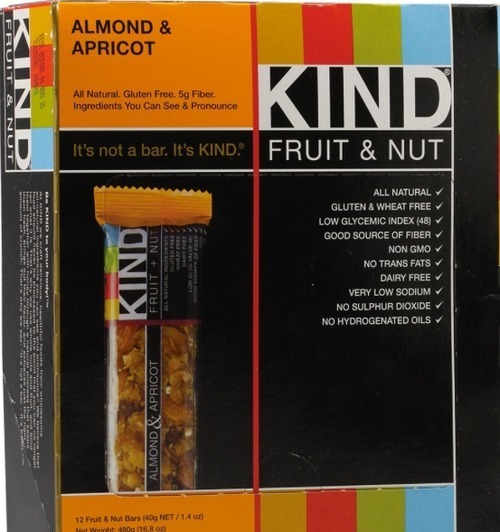 As far as the healthier bar, I bought a box of Almond Apricot Kind Bars at Whole Foods. I thought, this would be a good starter choice for this experiment. And unlike the candy bars, no high fructose corn syrup, no hydrogenated oils. We started with 83 bars total – 72 regular candy bars and 11 Kind Bars (that’s how many come in a box. I made sure to always keep half the tray visually full with Kind Bars, and half with the regular candy bars so that things were evenly spread out and I wasn’t making it obvious that I wanted them to pick the healthier treat. 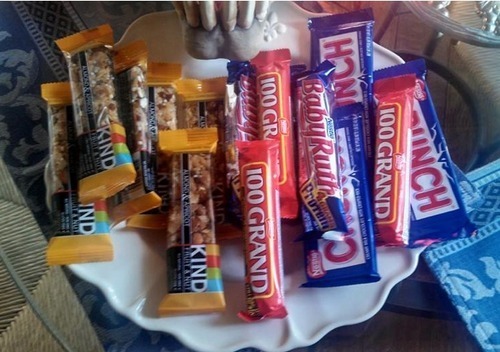 Now many of you might think that the Kind Bars just sat there until I ran out of regular candy. Not the case at all. In fact, the interesting thing was that they went evenly over the course of the night, amongst both boys and girls of very diverse ages – I would say between 7 and 15 years old. I loved the little (girl) ghost with the glasses – she was probably about 9 – who came to the door with her friend. These were the first trick-or-treaters of the night for us. She had a huge smile on her face when she selected the Kind Bar over the other the other candy, and she just gave the sweetest of thank yous. Now, naturally, many kids were also thrilled to see the regular-sized bars! It never hurts my feelings when the 15 years olds (3 of them – 2 girls and a boy), scream out, “Awesome!!!! You’re the BEST HOUSE OF THE NIGHT!” The kids who took the regular bars ranged from about 1 (that little giraffe was the cutest ever as his Dad carried him up to the front door – he was much more fascinated by the monster with the light up eyes on my door than the 100 Grand Bar he picked up from the tray), to about 16 years old. Yes, these were very popular options for many of the kids. In the end, 87% (we had 9 left) of the regular candy was gone, and 83% (10 out of 12) of the Kind Bars were gone. Again, I did think it was very interesting that over about 3 hours, each group of kids that came typically had one child who took the healthier choice. I thought this was a fairly good start, and I will definitely do this again. I hope this inspires more people to give it a try too. I’ll add some more healthy choices next year, and see how things continue to evolve. Of course, I would love to see how this experiment goes in other parts of the country. This is absolutely brilliant and I will be doing this!!! Absolutely brilliant and I will be doing this!! !